A congratulation letter from H.E Shaikha Mai Bint Mohammed Al-Khalifa, President of the Bahrain Authority for Culture and Antiquities, to HE Dr. Talal Abu Ghazaleh. A congratulation letter from H.E. Dr. Rawya bint Saud bin Ahmed al Busaidiyah, Minister of Higher Education, Sultanate of Oman to HE Dr. Talal Abu-Ghazaleh. 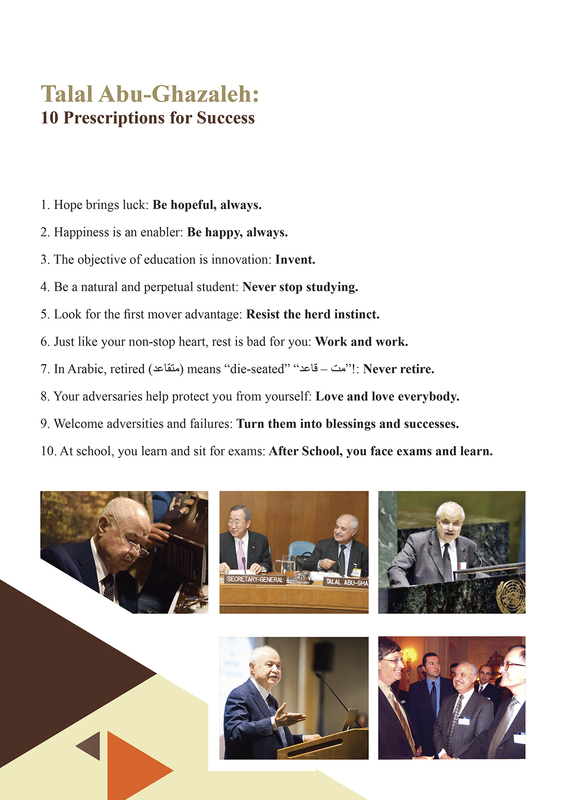 A congratulation letter from Professor Hammam Ghassib, Secretary General of the Arab Thought Forum, and Advisor of HRH Prince El-Hassan Bin Talal to HE Dr. Talal Abu-Ghazaleh. A congratulation letter from H.E. Eng. Imad Fakhouri. Minister of Public Sector Reform and State Minister for Mega Projects to HE Dr. Talal Abu-Ghazaleh. 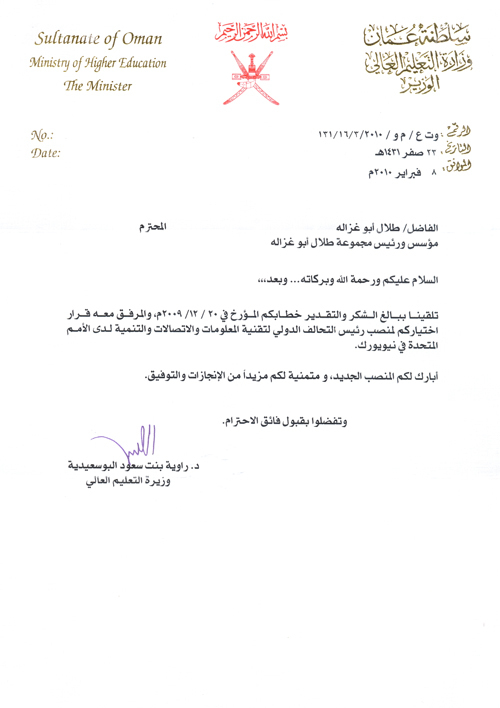 A congratulation letter from Dr. Walid Al-Maani, Minister of Higher Education and Scientific Research to HE Dr. Talal Abu-Ghazaleh. 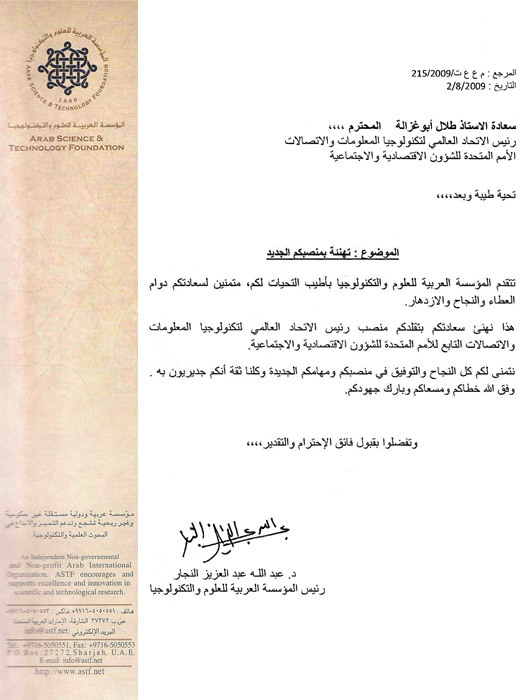 A congratulation letter from HRH Prince Talal bin Mohammed to HE Dr. Talal Abu-Ghazaleh. A congratulation letter from H.E. Abdullah bin Hamad Al Attiyah, Minister of Energy and Industry - State of Qatar to HE Dr. Talal Abu-Ghazaleh. H.E. Sheikh Abdullah Bin Thamer Al Thani, the Ambassador of Qatar to the Kingdom of Bahrain. Chief Executive Officer of the Jordan Dubai Capital, Amman-Jordan H.E .Samir Z. Al Refai. Mobinil Chairman Mr. Alex Shalabi. Secretarial Assistant of Information Society Division of the UNESCO, Paris – France Ms. Fatma-Zohra Bekhiti-Hales. The Chief Executive Officer of Modern Scientific & Electronic co Mr. Faris Zuhair Awartani.